Buy the original products in our official branches. Superconcentrate of a non-frozen fluid for cleaning a windshield of a car. Effectively removes ice and rime. Cleans windshields from any contaminations. Defrosts frozen fluid in a windshield washer reservoir. Prevents ice formation in the windshield washer jets. Prevents formation of oil coating on a windshield. Neutral to lacquer coating, chromium, rubber, and plastics. 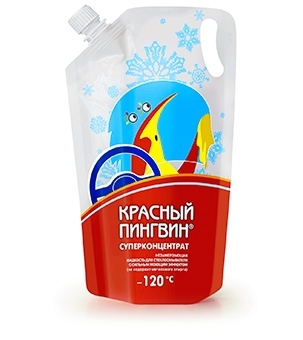 applied in mixture with water at temperatures below 0 °С. Pour the ready-to-use fluid into the windshield washer reservoir. The dosage is given in the Table. Pour the fluid only into the windshield washer reservoir.